Westgard Pass, photo by Harold Davis. View this image larger. 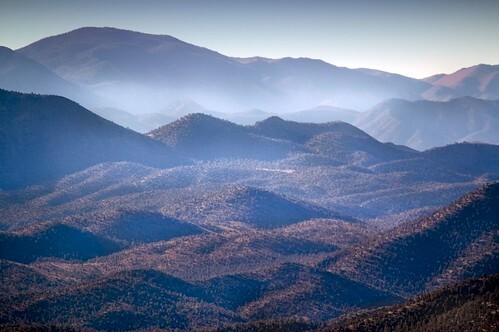 Westgard Pass lies below the Ancient Bristlecone Pine preserve in the White Mountains. It is the last stop between Owens Valley and the Sierras to the west and the great desert territory of basins and range that is Nevada and Death Valley. It’s wise to think of the RAW capture as a negative that can be post-processed many ways, just as a musical score is merely the basis for a performance. In that light, it’s instructive to look at an earlier (and somewhat less successful) version of this capture. Same RAW digital file, different processing. Remains of the Famous Jeffrey Pine on Sentinel Dome, photo by Harold Davis. View this image larger. 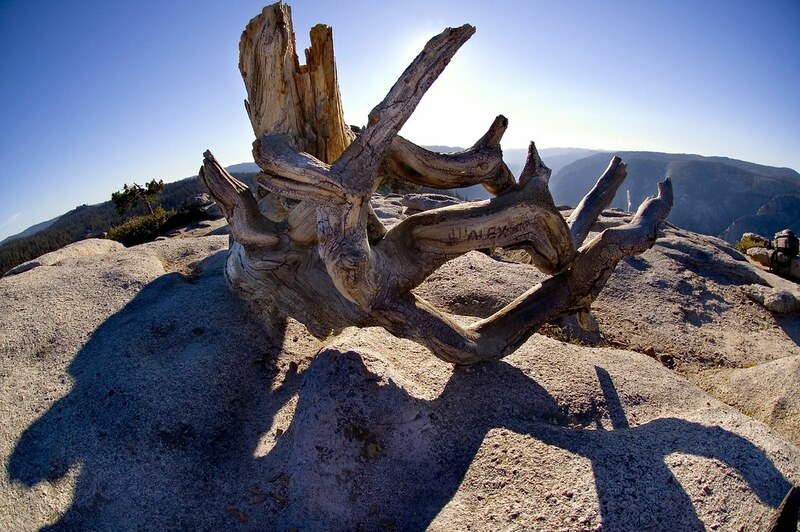 This is a fisheye photograph of the remains of the famous Jeffrey Pine on Sentinel Dome above Yosemite Valley. The tree was photographed as early as 1867 by Carleton Watkins, and later by Ansel Adams and many others. It died following years of drought in 1976, but was standing until mid 2003. It’s really sad to me that when I photographed the tree in 2005 on my Death Valley road trip, it had been defaced by graffiti. It’s true that Sentinel Dome is easy to climb and only a one mile hike, but come on! I hope “Alex”, whose name is carved in the dead tree, is deeply ashamed! 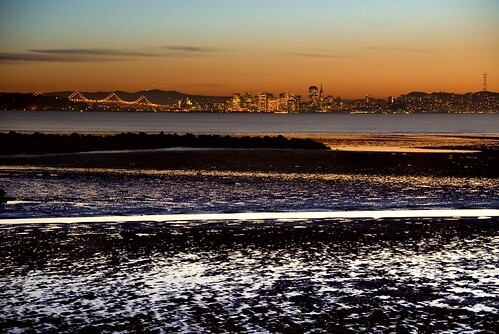 Bay View, photo by Harold Davis. View this image larger. This is a twilight-almost-night image from the roof of my parent’s home. The Bay Area is spread out below like jewels in the night. 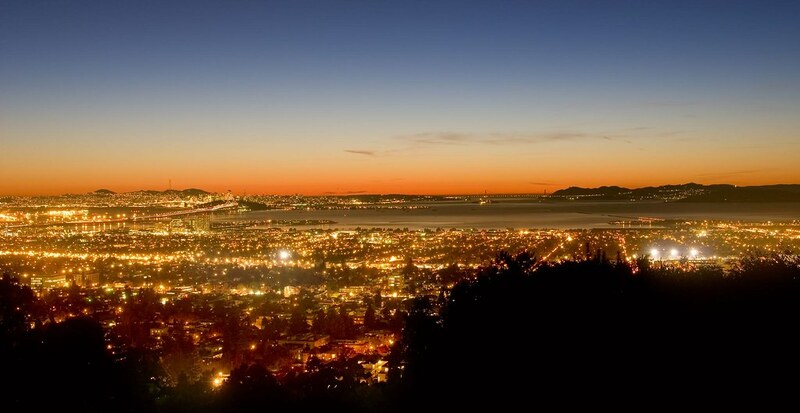 It’s amazing to me how the different color temperatures of the various lights used at night create a glow, or haze of light, above the city. 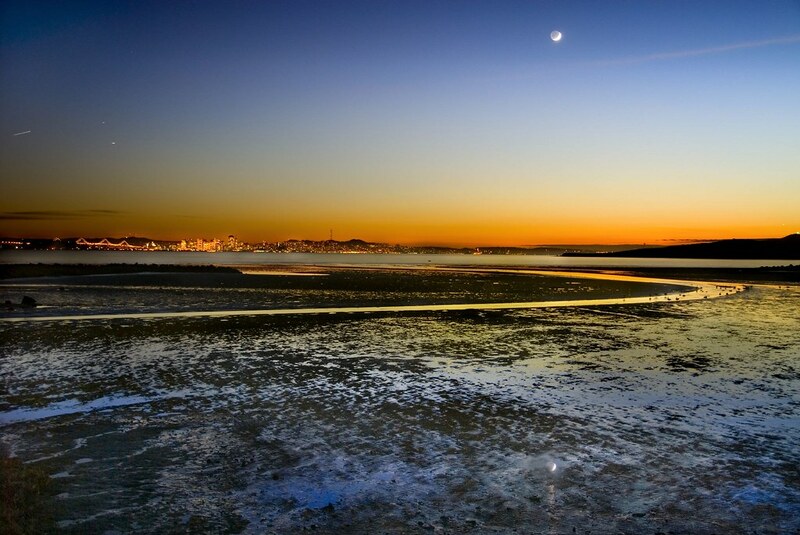 Moon and Tidal Flats, photo by Harold Davis. View this image larger. 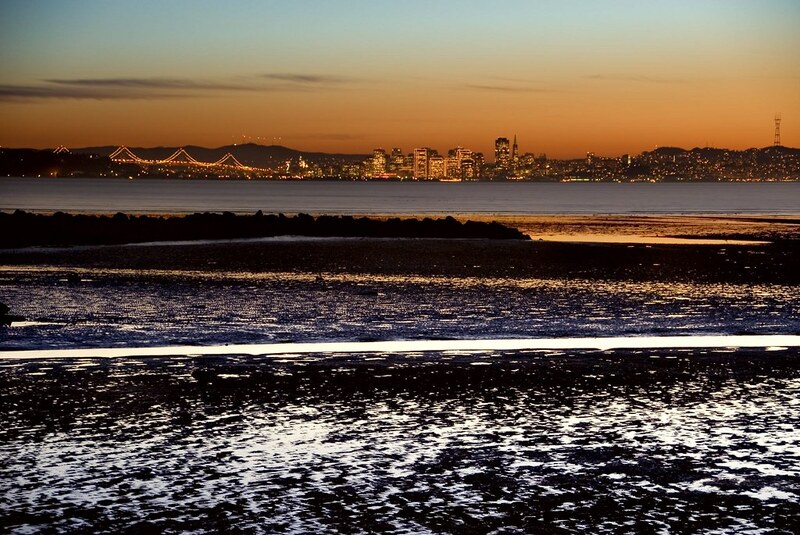 We seldom stop to think that a great deal of San Francisco, East Bay, and the cities around the San Francisco Bay are built on reclaimed marsh land. 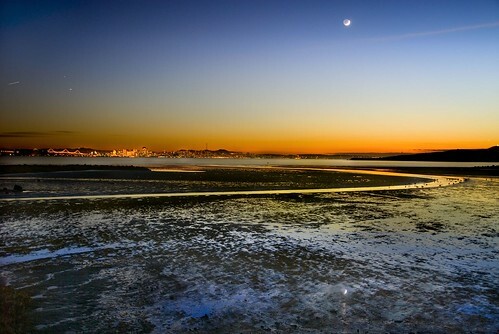 Or, more accurately, tidal flats. At the fringes, tidal flats survive that haven’t been built on, where the marshes survived the initial urge to fill-in and build, where they were marginal land used for dumping like the Albany waterfront, where they survived long enough to be saved as park. These oozy, stinky, beautiful spaces are filled with birds and are great places to photograph sunset and moonlight reflected in the slimey mud flats. These images are from a few days ago. They are taken from the tidal flats slightly north of Point Isabel. 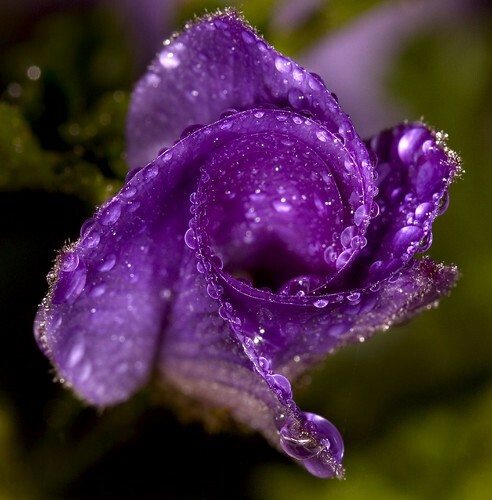 Hibiscus in the Rain, photo by Harold Davis. View this image larger. There’s magic in the moment, and joy in the seeing! May your holiday be one of peace, pleasure, serenity, and meditation! This is a world of grim depths as well as exalted heights, but for a while we can forget the terror and despair and focus on the awe and wonder in the knowledge that the days will grow longer and a new year is coming soon. This is a world of finite limits, but with infinite possibilities. I took this photograph of a hibiscus flower in my garden on a rainy day in December using my macro flash to stop the motion of the flower in the wind. Thus we stop time at this time of year, and spend a little quiet time with our families. Sunburst, photo by Harold Davis. View this image larger. How nice to have a beautiful, clear, and sunny day after a day of winter rain. 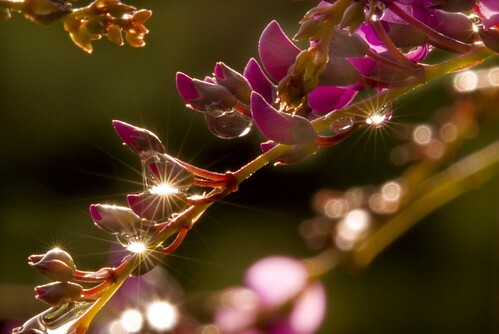 The morning sun in this image sparkles on rain drops that decorate the Hardenbergia (“Happy Wanderer”) that clings to the arch over my garden gate. 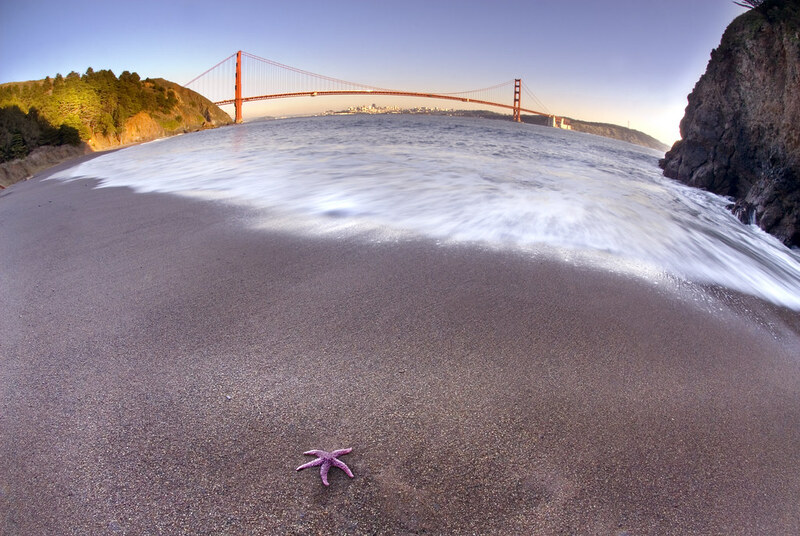 Starfish and Bridge, photo by Harold Davis. View this image larger. 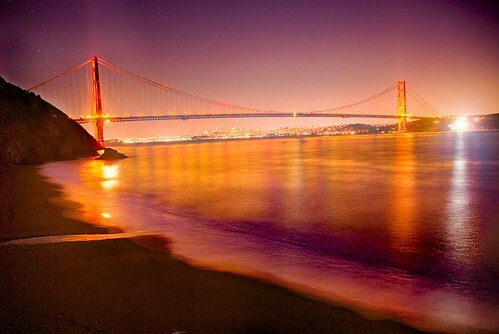 Kirby Cove lies on the Marin side of the Golden Gate. To get down to this beach you walk down a dirt road (it’s closed to cars) from the parking lot by the old fortifications above the bridge. 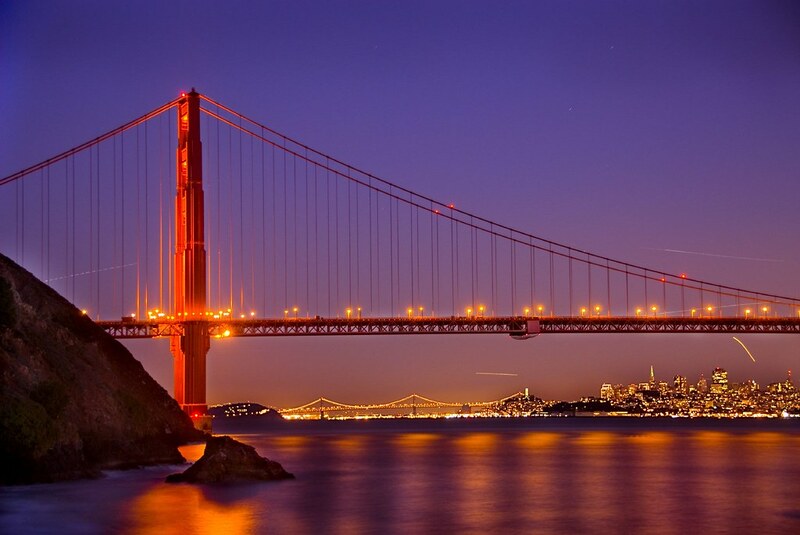 Here’s an image from the fortifications themselves looking down on the bridge and here’s a PDF map of the Marin Headlands area. If you plan to stay past sunset as I did, the hike back up in the dark isn’t too bad. 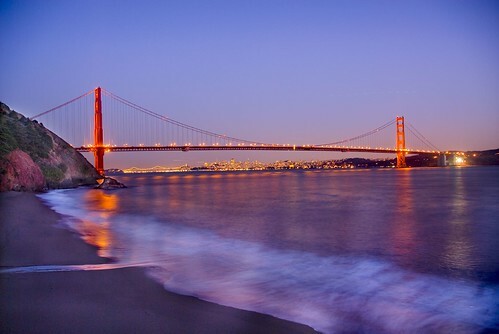 But be careful of the treacherous waters of the Golden Gate. The tide can come up fast at Kirby Cove, and much of the beach shown in these photos is under water at high tide. I found the starfish (above) in the rock alcove at one end of Kirby Beach. The tide was coming in fast. In the instant after my four second exposure completed, a wave rushed over where my tripod was standing. The glistening starfish happily followed the wave back into the waters of the Golden Gate. I photographed the sequence below from a small bluff above the beach. As night fell, the exposures got longer, and more and more of the light came from artificial sources (the bridge and city lights, mostly). The final exposure of the series (on the bottom) was a thirty second exposure. If you look at it closely, particularly in the larger size, you can see stars in the sky. Pond Reflections, photo by Harold Davis. View this image larger. Take almost any path you please, and ten to one it carries you down in a dale, and leaves you there by a pool in the stream. There is magic in it. Let the most absent-minded of men be plunged in his deepest reveries–stand that man on his legs, set his feet a-going, and he will infallibly lead you to water, if water there be in all that region. Should you ever be athirst in the great American desert, try this experiment, if your caravan happen to be supplied with a metaphysical professor. Yes, as every one knows, meditation and water are wedded forever. 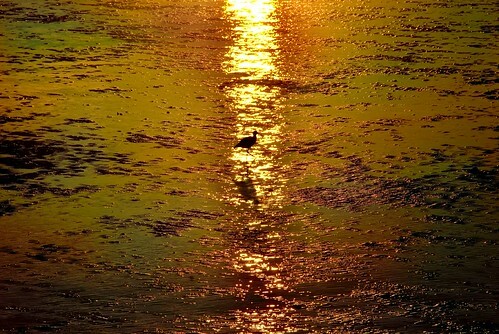 World without End, photo by Harold Davis. View this image larger. There’s more to this picture than meets the eye. Put another way, no matter how hard you look at the on-screen version, even in its larger size, you won’t see everything that is in the image. Let me explain the alpha and omega of it. The photo the image is based on started as a time exposure of the corridor in the Officer’s Quarters at Fort Point under the Golden Gate Bridge in San Francisco. (View the EXIF data here.) This was a normally-sized photo taken with my Nikon D200, so at 300 dpi (dots per inch) it measured 2592 X 3872 pixels (about 8.6 X 12.9 inches). I mention the dimensions of the image because they become an issue later in this story. 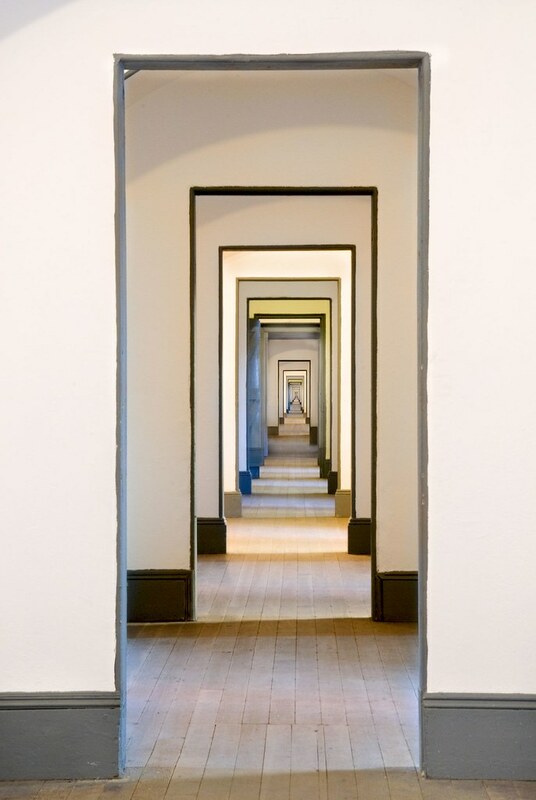 When I looked at the photo on my computer, I saw six “regressions”–or doorways on the corridor. At the end of the corridor was a dusty, dark, and unattractive display case. I decided to replace this unattractive display case with a proportionally smaller version of the duplicated image itself, to make the corridor seem to go on longer (for twelve apparent regressions). It wasn’t very hard to paste a smaller version of the image in, thus extending the corridor to twelve doorways. I duplicated the image, measured the size in the original image I needed, and resized the duplicate accordingly (to about 1/6 of the original dimensions, as it happens). Next, I dragged the small version of the image over the large version to position it in place, and dropped it to add it to a layer in the original image. I used a layer mask, the Paintbrush Tool, and blending modes to combine the smaller version fairly seamlessly into the large version. In addition, I realized that at the point in the process where I flattened the layers I’d need to do a bit more detailed retouching using cloning and related Photoshop tools. It’s worth noting that as a matter of workflow I had to flatten the layers in my image a number of times. Each time I did this, I saved an archived version of the image with the layers still intact (except, as you’ll see later, when my layered versions exceeded Photoshop’s maximum file size of 2 Gigabytes). I did this archiving at every step of the way where it was possible, just in case I later decide to rework the image, and I won’t note that I did it each time (but you should do it too when you work with layers). Looking at what I had, the thought occurred to me, why not repeat the process? So I resized the duplicate image once more, down to about 1/6 of the reduced size, or 1/36 of the original size, and added the new, small version in position as a layer to the original image. Once again, I used a layer mask, the Paintbrush Tool, and blending modes to combine the versions, with the understanding that further retouching would be needed eventually. Now I was up to eighteen regressions, and the corridor with doorways looked pretty infinite to me. But, in fact, the corridor didn’t go on forever. I had to get up pretty close to it, but at 1600% magnification I could see a highly pixelated version of the ugly old display case. Looking at this 12 X 18 pixel canvas at the end of the known world, I figured why not write something on it. True, no one would be able to see what I had written without being able to examine a full-size version of the image in Photoshop or comparable software at high magnification, or perhaps by vliewing a good, large print up close with a magnifying glass. But it seemed worthwhile to embed a secret in the corridors of apparent infinity. Typography at this small scale proved to be surprisingly difficult, and I had some much appreciated help from Phyllis. I can’t tell you how much it helps my work having a spouse who is also a graphic design whiz! My first thought was to write my name, but “Harold” simply wouldn’t fit in the space I had, even with the strokes only one pixel wide. So a single letter would have to do. In a representation of infinity, perhaps α (alpha) or ω (omega) would have been most apt, but I settled for the more egocentric “H”. (I am, after all, at the core of my own solipsistic universe!) As I’ve said, you’d need to view the original Photoshop file at maximum magnification to see this character. But wait! The plot thickens (or thins)! Things get even crazier. It occurred to me that although I couldn’t paste in another smaller copy of the image there was nothing to stop me from blowing up a copy of the current large image to make it bigger, and then pasting the current large image into the even larger version. 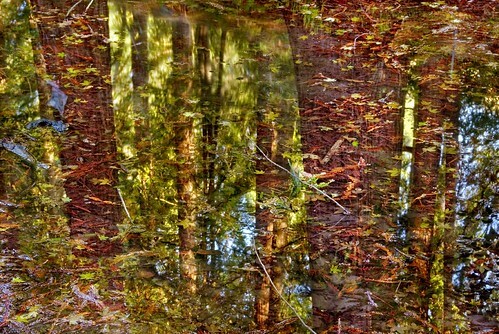 After the flattening the image with type layer and the layers with the two smaller versions, I duplicated it. Next, I used the SI Pro 2 (Stair Interpolation Pro) Photoshop plugin from Fred Miranda Software to blow the image up. As you may know, there are quite a few Photoshop plugins that automate the process of stepping an image up without appreciable quality degradation; I’ve had good luck with SI Pro. If you are interested in using the SI Pro 2 plugin, it costs about $25 to download from Fred Miranda Software (you’ll find the link about half way down the page on the left). I’ve used it successfully to upsize images, and also to size images precisely for printing with margin areas on particular paper sizes. I figured I needed to blow the image up 6X to be able proportionally to fit the 18 doorways into it, for a new total of 24 regressions (I am fondly calling each doorway a “regression”, although of course technically it is no such thing). After enlarging the duplicate six times, the new dimensions were 15,300 X 22,857 pixels at 300 dpi (or about 51 X 71 inches at 300 dpi). It still looked pretty crisp on my monitor. I was bumping up against a Photoshop limitation, namely a maximum image size of 30,000 X 30,000 pixels, and a maximum Photoshop file size of 2 Gigabytes. I was to find out about the file size limitation when I tried to save a layered version of the large-size image. And now, a word about my hardware. 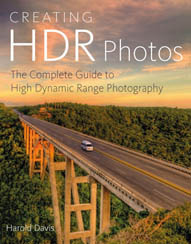 I noted in an earlier story that it takes quite a bit “under the hood” for me to post-process my images, particularly when complex channel operations are involved. Specifically, I do my image processing these days on a Mac Pro with 2 X 3 Dual-Core Intel Xeon processors (four processors in total), 5 GB of blazingly fast 667 MHz DDR2 RAM, about a terrabyte of SATA disk storage, and a 30 inch Apple Cinema monitor. True, Adobe hasn’t come out yet with a native version of Photoshop, but even in simulation mode this is pretty good hardware. On the large-sized image, things slowed to less than a crawl. Simple operations, like displaying a histogram, or adjusting a curve, took minutes. While I waited for each operation to complete, I could not only twiddle my thumbs and drink a cup of coffee, I could brew the coffee as well! A good thing I also have my Windows XP machine going for mundane tasks like email, word processing, and blog writing! Here’s to multitasking if saving a file takes half an a hour! So now I took the 2592 X 3872 pixel image, with the 18 regressions, and pasted it in position as a layer into the 15,300 X 22,857 pixel large version. As I’ve noted, when I tried to archive a version of this image with the layers intact I hit the 2 Gigabyte file size limitation of Photoshop, but fortunately I could work on the image in Photoshop with the layers even if I couldn’t save it, and I just squeaked by just under the 2 GB limit when saving layer-flattened versions. Besides simply elongating the corridor, an interesting optical effect happened when I combined the images. The doorways start sharp, and gradually lose apparent sharpness as the eye goes down the passage (and the image gets magnified). But at six doorways in, where the pasted original version takes over, the doorways get sharp again. This effect creates an illusion that the passage is even longer than it is, because it doesn’t seem to lose definition as the eye travels down it. You won’t really be able to see all the doorways in the version on the web. You certainly won’t be able to see the H embedded at the end of the World without End. There simply isn’t enough resolution. To fully see my image, you’ll need to come visit me and look at it on my monitor. You could then inspect the end of the corridor at 1600% magnification and see the H.
Of course, I’d also like to make a print that is close to one-to-one. Alas, my Epson 4800 only goes up to 17 inches wide. There are a number of places around here where I can get my hands on a 9600, with a maximum width of 44 inches. A little smaller than I’d like, the print on a 9600 would end up about 40 X 60 inches. I’ll bet that with a magnifiying glass you could even see the end of the corridor. How’s that for finding infinity’s end? 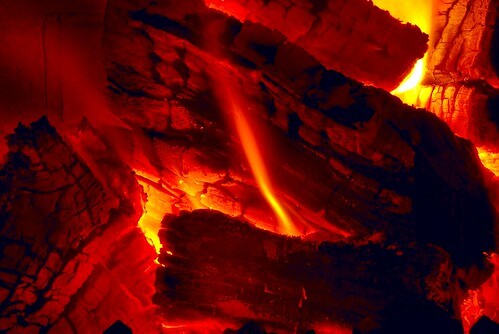 Fire, photo by Harold Davis. View this image larger. Somewhat surprisingly, fire and moving water can pose similar photographic challenges. With both fire and water, you may want to get a great deal of depth of field to get different parts of a photo in focus. High depth of field images tend to have the appearance of sharpness because nothing is out of focus. To get high depth of field, you need to close the camera down and use a small aperture on your lens. 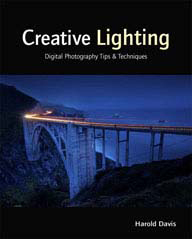 This implies a long exposure, even considering the brightness of flames and the lightness of foam in a waterfall. But with a long exposure, both flames and moving water can appear almost solid, very different from the way fire and water look to our naked eyes. Surfing the Golden Gate, photo by Harold Davis. View this image larger. 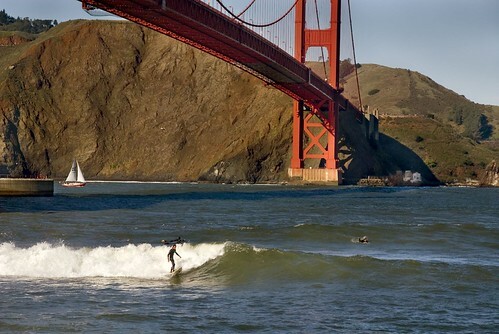 Who would have thought that it is cool to surf beneath the Golden Gate Bridge? Apparently those “in the know” know that the swells are swell, for sufing that is, in mid December. 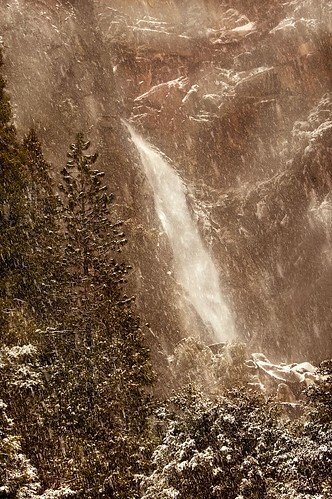 Falling Snow, photo by Harold Davis. View this image larger. The plunging waterfall seen in this image is The Cascade, found just off Route 140 coming into Yosemite Valley before the junction with SR 120. If you think the image looks a bit hazy, look closely at it in the larger size. You are looking at falling snow! Special thanks to Leon Turnball, who helped me correctly identify this waterfall (yes, I can sometimes confuse locations after the fact! ), and whose web waterfall gallery has an excellent photographic directory of California waterfalls. 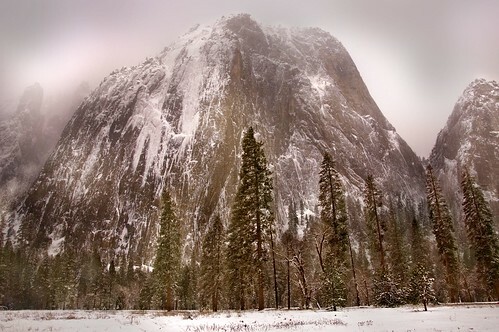 Church Tower from El Capitan Meadow, photo by Harold Davis. View this image larger. Mystical, primeval world! Wow!!! Could be a painting from Caspar David Friedrich (1774-1840). The image (I mentally dithered a little as I composed this sentence between “photo” and “painting”, but settled on the neutral “image”) that Paul graced with his comment is in the same series as the winter image above and also Yosemite Dreams. Of course, I am wonderfully flattered by the comparison and the comment. But truth to tell, I was not familiar with the work of Caspar David Friederich before now. Certainly I’ve enjoyed getting to know his work, with his romantic and mystical view of landscape. I see Friederich as a precursor to the luminist painters of the Hudson River school and the American west. It’s too bad that Hitler also liked his work, but not after all the artist’s fault since he died in 1840. This is certainly how I view my hybrid art: one part photography, one part digital manipulation, in an attempt to recreate my feelings and vision about the scene rather than a literal recreation of the scene (as if this literal recreation was possible in the first place!). The problem with heroic and romantic landscape painting by artists like Caspar David Friedrich and Albert Bierstadt, or even the monumental landscape photographs of Ansel Adams, is that the work can verge on the overwrought and sentimental. On the other hand, at its best it is transcendent and spiritual. Thank you, Paul, for recognizing my aspirations. Golden Gate Bridge from Baker Beach, photo by Harold Davis. View this image larger. 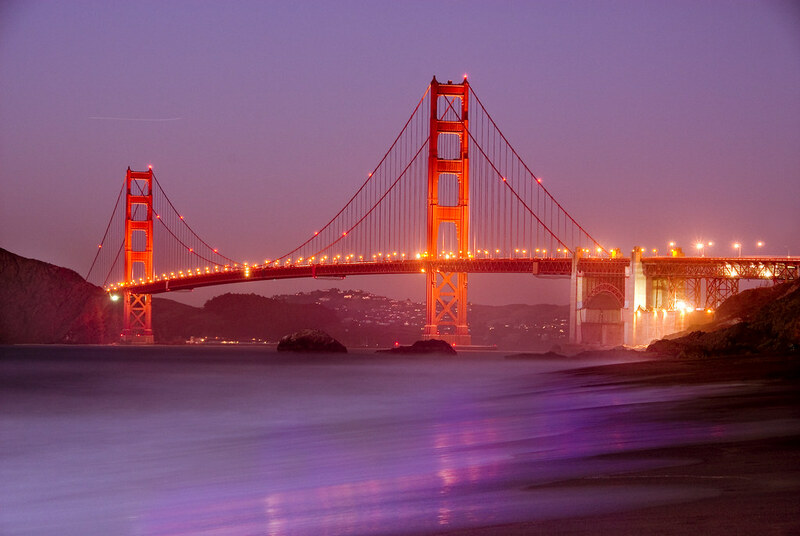 The bridge lights glow and the surf turns into an eerily solid mist in this time exposure from Baker Beach that is not a camera toss! Fairy Lights in a Water Drop, photo by Harold Davis. View this image larger. Inside the fire was burning, the Christmas tree was lit, and the family was happily and merrily manufacturing mayhem. I stepped outside to taste the weather and for a moment of quiet. The rain had stopped and the world was very still and foggy. 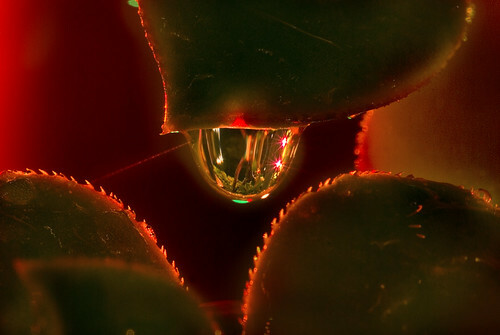 I noticed that the succulent on our front porch was plastered with jewel-like water drops, and the drops reflected our outdoor Christmas lights (or, as they call them in England, Fairy lights). These were long time exposures. Fortunately, everything did stay very still. There was not a breath of wind. It was hard for me to keep my concentration hearing the ruckus inside. Nicky came out, and held down the remote shutter release for me on a couple of the exposures in the series, including this one. He was proud to help, and it was fun “keeping still” for the exposure with him. And, yes, I am pleased with how this image came out.